During a blizzard, a broken garage door can be a true disaster, stranding you and your car out in the cold. Even if it doesn't stick, though, the winter poses some risks that require a little advance preparation. Felluca Overhead Door, Rochester's leading garage door repair and installation experts, would like to offer some tips for keeping warm air in, while keeping winter's harsh weather and outdoor pests out. Checking The Insulation: Even if you bought a well-insulated door and installed new weatherstripping last year, it's a good idea to check it again before the cold weather hits. Dry, brittle weatherstripping and cold drafts coming around your garage door can let cold, moist air in, which can make your entire home a little less comfortable. 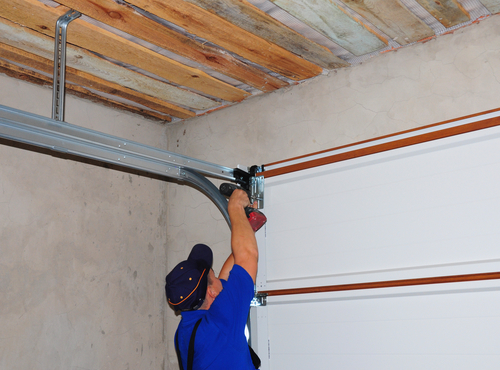 Lubricating The Joints: The moving parts in your garage door should stay lubricated all year long, but these routine maintenance tasks are even more important as the cold weather sets in. Making sure everything is in peak working condition will help prevent the kind of problems that can leave you locked out or stuck in your garage. Getting a Professional Inspection: If your garage door has large gaps around the edges or is getting older, call in an expert to look it over, find any problems, and solve them before any major disasters arise. They'll also have access to advanced weatherproofing products, closing gaps that might let in snow, ice, or insects. For over a century, Felluca Overhead Door has provided generations of Rochester homeowners with friendly, expert service and some of the best products on the market. Visit their website to see samples of their work and play with some designs of your own, or call (585) 467-2391 to request a quote today.